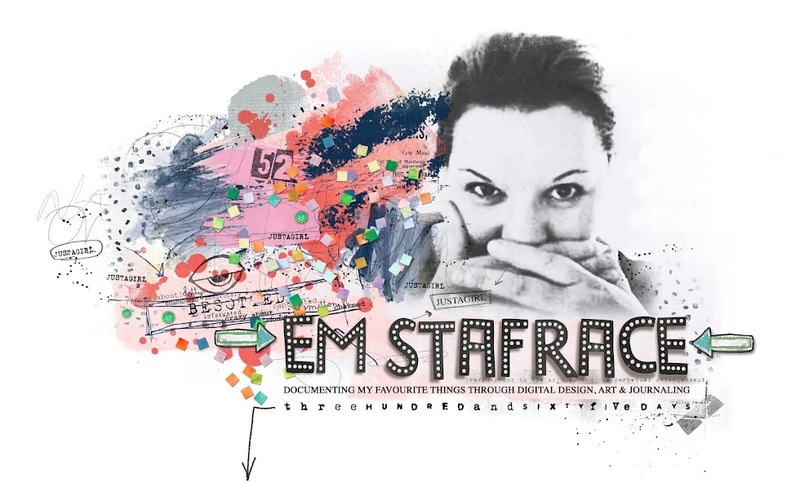 Em Stafrace| Just a Girl with Ideas: HE'S A BIG BOY NOW! Here is my DT page for Bird is the Word . The current word prompt is 'Discover' which lends itself to tonnes of fun pages and project themes. Its the cutest piccie of Tig-let at his birthday party, and was taken by Sarah Rickard who snapped so many cool photo's thanks so much hunnie, check out her blog 'My life with Pirates, Jedis and Superheroes' Sarah also has a fabulous business called 'Little Birdie Nappies'. It was Tige's 1st birthday on the 7th feb and we celebrated that following weekend when his daddy was home form the rig, with a fun 'Cheeky Monkey' themed Pool Party. We had so much fun swimming, eating and hanging with friends. 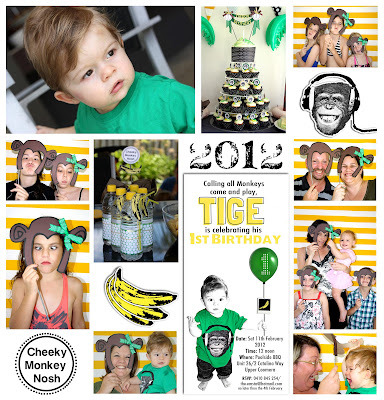 I had a cool photobooth set up with cheeky monkey masks that I found at my fave site called Oh Happy Day in their downloadable freebie section. Here are some of the fun piccies we took and of course the cake and all that jazz. Looks like you had an amazing time at the party Em! Where did that year go? WOw, This page is a breath taker !!!! So soft and sweet ! Fabulous work you make me so jeleous my dear Ausie friend ! Great pictures of Tige's 1st birthday !!! Apart from the spectacular and fabulous design, I was blown away by the colour combo of your page, Emma!!! 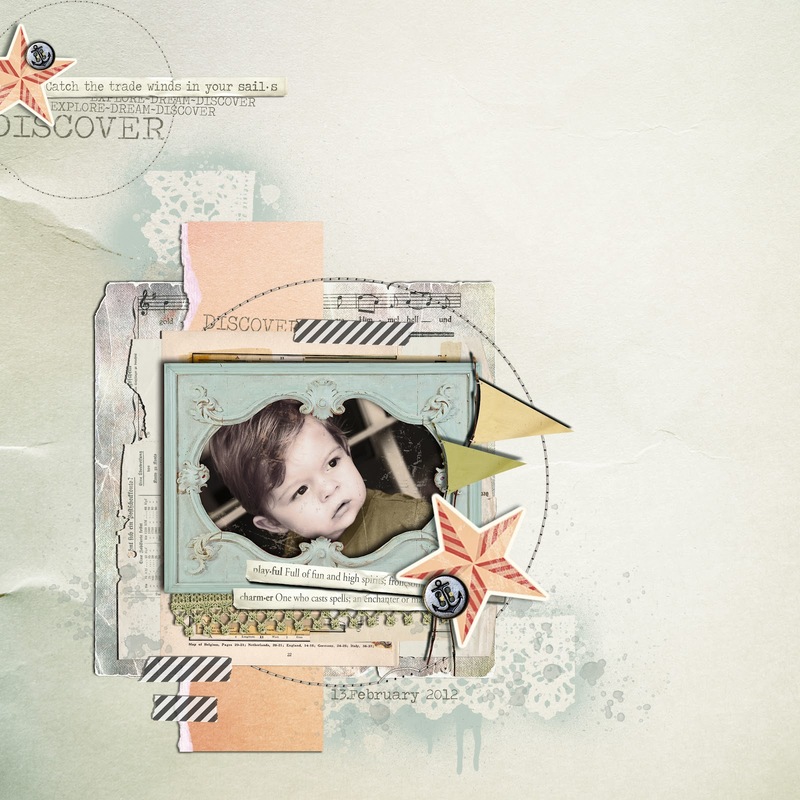 Everything about this layout is perfect - you simply know how to make a perfect page. I'm in love!!! The soft delicate colors combined with that cute lil face are just adorable, Em. 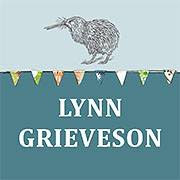 Love just about every page you've ever done! Thanks for your kind comments. I'm really honored!!!! Wow! This is just fab! Love everything about this!